Namaskaram! Our greetings and well wishes to you. Kala Vandanam has the privilege of sharing the arts and culture of South India through participatory, high quality experiences. 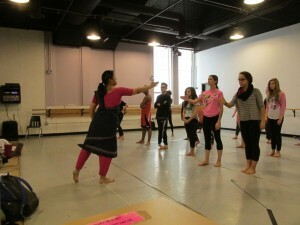 Through exploration of the allied arts Bharatanatyam, Carnatic music, literature, and yoga, integrated with mathematics, history and current events, Suchitra Sairam and Kala Vandanam Youth Dancers share the sights, sounds and feel of Indian culture as experienced in the United States. Born in Chennai, India and raised in the United States, Suchitra Sairam brings the personal experience of cross-cultural synthesis, blending the beauty, depth and spirituality of Indian arts with the thought process and values of the western aesthetic. She is able to effectively relate the relevance of art forms with ancient roots to the current day, and believes in the exploration of diversity in culture, experience, and values to find common ground. With her nearly 30 years in the arts and 20 years of diverse experience in business, Suchitra is a highly experienced professional on all fronts. Her goal is to contribute to constructive introspection for personal growth, encourage creativity, exploration and enjoyment, and share experiences to enhance understanding through movement, music, storytelling, and creating original art. Explore the movement, music, stories and culture of India through a presentation, demonstration or residency by Kala Vandanam for your community group or school. Please contact us, we would love to customize something for you!